Book Skilib Alpine Lodge NOW! SkiLib Mt Buller Accommodation is located at Mount Buller Alpine Resort, 250km north east of Melbourne and rising to an altitude of 1804 metres above sea level. The Resort embodies some of Victoria’s most spectacular alpine and sub-alpine terrain. It offers 263 ha of ski trails as well as wide open spaces above the tree line, with the longest trail being 2.5km. As winner of the Australian ski Award for “Best Year Round Resort” two years running, Mt Buller offers a multitude of activities in both summer and winter. SkiLib Mt Buller Accommodation is located within a gentle stroll to restaurants, bars, shops, lifts etc, yet quietly located away from all the hustle and bustle. The Mt Buller Resort Management provides a complimentary shuttle bus, which tours the village and will drop you near our door. 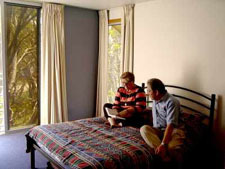 Our Mt Buller ski lodge accommodation offers guests two types of accommodation – ensuited rooms that consist of a double bed and a roll-away trundle for added room variation and the standard room, which consists of 2, 3, 4 and 5 berth rooms all made up with varying combinations of single, bunk and double beds. All rooms provide doonas, pillows and blankets.